I have been a Nintendo fan since the massive success that was the Nintendo Entertainment System (NES), but they weren’t always such a well-known console corporation. Nintendo started out as a Hanafuda card company nearly 100 years before the NES even existed. Fusajiro Yamauchi founded the company in 1889 in Kyoto, and it was kept in the Yamauchi family until the late Satoru Iwata took over as president in 2002. The first electronic games that Nintendo produced were the series of games on the hand-held Game and Watch in the 1980s. They came as individual hand-held games that were pre-installed and played on a LCD screen; this differed from the later hand-held consoles which allowed interchanging of games via cartridges. 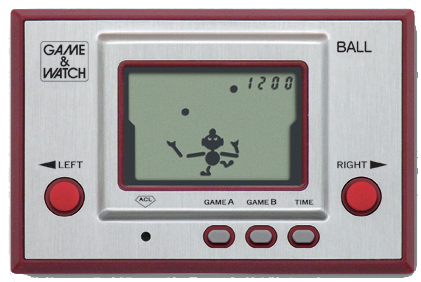 Over the years, the Game and Watch had over 50 games available on the various models, and remained popular until the release of the Game Boy. The Game Boy came around in 1989, with the idea of combining the popularity of the portability of the Game and Watch, and the cartridge based interchangeability of the NES. Various advanced versions of the Game Boy were launched over time, including the Game Boy Colour and Game Boy Advance, before Nintendo moved onto something completely different with the Nintendo DS in 2004. The DS still stands today as Nintendo’s most popular console, coming second only to the PlayStation 2 in the best-selling consoles of all time. It differed from the Game Boy because it had a dual screen that also enabled touch screen technology; the DS also had a built-in microphone and WiFi technology. The Nintendo 3DS was the first hand-held console to incorporate 3D effects without the need for 3D glasses. Sadly the 3DS proved to not be as popular as the original DS, with Nintendo’s profits plummeting and staff wages having to be cut; it has sold only one-third the amount of units that the original DS did. Complaints when the 3DS was 1st released included the short battery life and the awkward angle needed to get the 3D effects to work; the 3DS XL addressed these issues and was received well at launch. Nintendo’s first home console came in 1983 (1985 in America) with the Nintendo Entertainment System, or the Famicom as is was better known in Japan. The NES helped the video game market to recover after the famous American crash, and it was the first of the cartridge based consoles. The NES saw the launch of some of its most iconic franchises that still exist today, including Super Mario Bros., The Legend of Zelda and Metroid; many online polls consider the NES to be the greatest console of all time. The controller was the classic A/B brick design, but there were numerous special controllers released for use with specific games, including the NES Zapper and R.O.B. The Super Nintendo Entertainment System (SNES) arrived in 1990 in Japan and was worldwide by 1992. It was the first console of the 16 bit generation, but had tough competition from Sega’s new console, the Sega Mega Drive. Despite the competition, it was still the best-selling console at the time. It was considered the best console of the 16 bit generation due to the advance graphics and sound capabilities compared with the other available consoles. Whilst many classic games from the SNES are remembered, including those such as Super Mario World and Donkey Kong Country, perhaps the one that stands out most is Street Fighter II as it was the first console port of the popular arcade game. The N64 came out in 1996, with the name deriving from the fact the console had a 64-bit central processing unit. When the N64 arrived, so did two very well-known games; GoldenEye launched a new genre of games known as first person shooters, and the action-adventure game The Legend of Zelda: Ocarina of Time is considered by many to be the greatest game of all time. The creation of the N64 brought about major controversy due the fact Nintendo were in talks with Sony about making a disc based console instead of one that used cartridges. When the deal fell through, Nintendo went ahead with the cartridge based N64, and Sony went on to launch the first PlayStation; whilst the N64 was still a success, the launch of the PlayStation negatively impacted upon Nintendo’s sales and shares. The next up in the list of Nintendo consoles was the GameCube, and whilst it was well received, it faced tough competition from Sony’s PlayStation 2 and Microsoft’s new console, the Xbox. The PlayStation 2 is the best-selling console of all time, with greater than 155 millions units being sold compared to the GameCube’s poor 22 million. The Wii was available in 2006 and it was another major hit for Nintendo that helped them recover from poor GameCube sales. The revolutionary motion control sensor and wireless remote provided gamers with an alternative experience to that which Sony and Microsoft had to offer. The Wii outsold the PS3 and the Xbox 360 for a time, selling over 100 million units compares to roughly 84 million for the PS3 and Xbox 360. The success of the Wii is thought to have been due to the fact Nintendo tried to aim their new console at a different market to those that Sony and Microsoft were aiming at. They tried to incorporate the casual games market, as well as young children and families. The focus on fitness based games gave the Wii an edge over the other consoles, which they later tried to copy. The most recent console, the Wii U, saw Nintendo’s staff having to take another pay-cut due to terrible sales at launch. Even today, the Wii U has only sold just over 10 million units, which is on par with the low sales of Sega’s Saturn and Dream Cast consoles that caused Sega’s existence on the console scene to crumble. Whilst the Wii U did differ from the Wii with its new gamepad technology, a lack of games at launch contributed towards poor sales. The sales and number of games available have slowly been improving over time, but it might be a case of too little too late for the Wii U. The future of the next Nintendo console is currently unknown, but there are plenty of rumours. The consoles code name is the NX, and it is thought that it might incorporate virtual reality. It would not be surprising if Nintendo did go down the virtual reality route as they are a very innovative company, but whatever the future holds for Nintendo, the next console will need to sell well to help them get back on top.